As I've posted before, I don't like the term slum. Shantytown isn't much better as a term, but somewhat. The other option is squatter settlement - but it sounds very high register and does not include those that have gotten legal title. In English I prefer poor neighborhood really. in El Salvador the term is 'comunidades marginales', one of my personal favorites that I think travels well, ie, others will understand it even if they don't normally use it, unlike villa. the other option is asentamiento informal, but that's pretty high register. 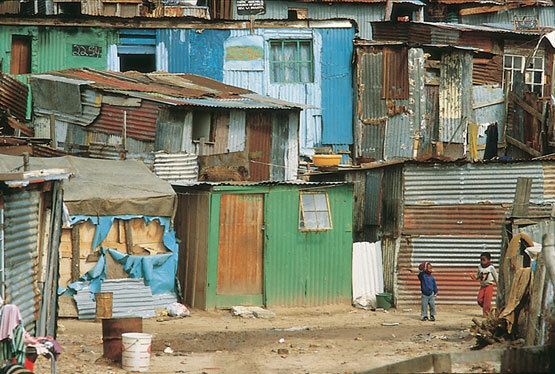 A "colonia popular" in Mexico is not a shantytown. Colonias populares are low-income government developed housing complexes. The term we use to refer to shantytowns is "ciudades perdidas" (perhaps a bit worn out lately) and, more recently, "colonias de paracaidistas". I'll be happy to help you double-check when you refer to terms used in Mexico. Chile: "población callampa" or just "población"
I just found your blog. It's GREAT!!!! Thank you!!! In Ecuador specially in the urban context, we use "suburbios" which I think it's very very interesting comparing it to the meaning of "suburbs" in English, in spanish it refers more of the outskirts or beyond the border of certain neighborhood. It does have a little academic connotation but if people watch the news that's what is used so it's not uncommon. Love this blog! In Ecuador we use "suburbios" which does have a little bit of a formal/ academic register, but it's used in the news. In general barrio popular would be good depending of the context. "suburbio" it's very interesting to me given the meaning of the word in English. Love this blog! In Peru they are formally called Asentamientos Humanos (A.A.H.H.). Pueblo joven is a very dated term, as the idea of young towns suggests that places that were squatted are somehow behind in their development. On the contrary, places in Lima like Los Olivos, or sections of Independencia (Plaza Norte), San Juan de Lurigancho (Zarate, Las Flores), and San Juan de Miraflores (Ciudad de Dios) are sites of intense capital accumulation and/or feature individuals that have found mobility through capitalism. These specific sites are very much products of uneven development, and look nothing like human settlements that are made of out "material no noble" and lack water and sanitation hook-ups, paved roads, etc.